Potato is such a versatile vegetable; boiled, fried, sauted, roasted, deep fried and mashed. But stir fried? This is what attracted me to try this recipe, popular in Northern China like Beijing and Shanghai. Northern Chinese has a lovely name for potato called 'tu dou' or translated as bean of the earth. Stir fried potato is a very simple poor man's recipe. Normally the potato is stir fried with only a bit of garlic, chilli and some spring onion. I like a more complex flavour so I added carrot and some Sichuan preserved vegetable (zha cai). 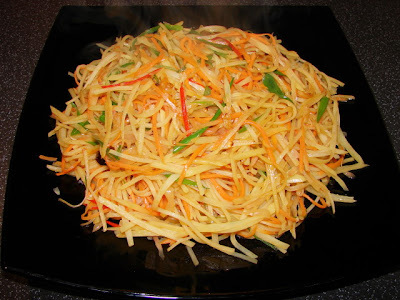 The key to prepare this dish it to shred all the vegetables very very fine. I got a Japanese mandoline which saves a lot of work. The potato must be washed to remove all the starch and soaked till crunchy. I really like this recipe, the flavour is light yet fragrant with the spices. The vegetables are crunchy and delicious. Thoroughly recommended if you like a cheap vegetarian dish. Shred the vegetable into very fine strips, you can use mandoline for the potato and the carrot. For the shredded potato, rinse several times to remove the starch then leave to soak in cold water for about 20 -30 minutes, then drain. You need to hand cut the Sichuan preserved vegetable, don't work with the mandoline. After cutting, rinse with water to remove some of the saltiness then squeeze dry and leave aside. In a pan or wok, heat some oil and add the Sichuan peppercorns and fry till you can smell the fragrance of peppercorns. Use a slotted spoon and remove all the peppercorns and discard. Add in the dry chillies and garlic, fry till fragrant. Turn the heat right up and add the vegetables and fresh chilli, stir fry for a minute or two add vinegar, soy sauce and sugar to taste. Continue to stir fry for another minute or two till all the vegetables are very hot and tender but still quite crunchy. Stir in the spring onion and the dish is ready to eat. 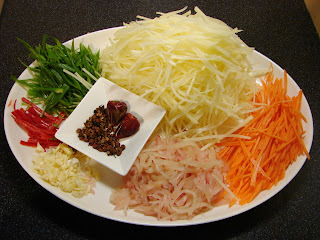 If you don't have any Sichaun preserved vegetable (榨菜), you can sub with any chinese pickled vegetables like snow vegetable (雪菜) or pickled mustard (鹹酸菜). *This post is kindly supported by OGourmet, fine food shopping for best balsamic vinegar. Hi There, my name is Sherri and I am from the UK. I had a wonderful srir fried potato, beancurd and chili dish the last time i went to China(Guangzhou) and I have wanted to eat it so much but have no idea how to cook it. The beancurd was a different texture to the normal kind you fry, it was shreded thinly and seemed to have been driedd before possibly or preserved? Do you know this dish and the correct ingredients to use? At least I know how to make the potato thanks to your article now! Do you think the tofu is fried (i.e. egg yolk colour or brown) or just fresh tofu (beige in colour)? You can get ready fried tofu from any Chinese supermarket just sliced and add to the stir fry. If fresh you need to get some plain firm tofu, Chinese or from your local supermarket, season with salt and/or pinch of five spice then wrap in muslin and weigh down with something heavy for few hours or overnight till the tofu is very very firm. Then slice or shred and stir fry with the shredded potato. I made this last night- really delicious, and satisfying to eat! The finely shredded bean curd was probably dried bean curd skin, available in rolls. Soak and then cut. I've tried a similar version of this shredded potato dish last month at a Chinese restaurant in Japan! !